COLUMBUS – Ryan Day won the press conference. If he handles being Ohio State’s acting football as smoothly the Buckeyes should be undefeated when Urban Meyer returns from his three-game suspension on Sept. 22 when OSU plays Tulane. 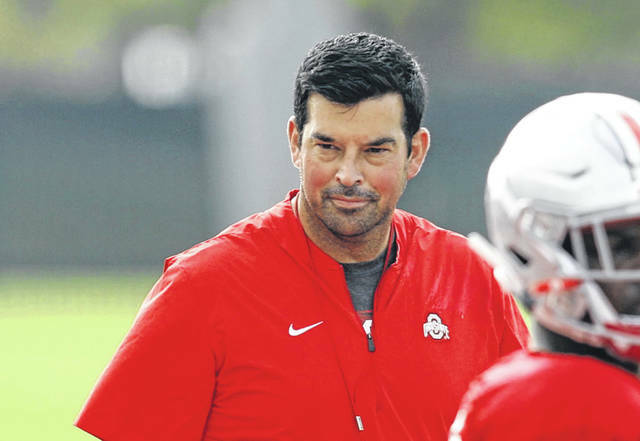 Day, who also shares the offensive coordinator’s duties with Kevin Wilson and is OSU’s quarterbacks coach, occupied the Monday morning press conference slot usually occupied by Meyer during football season on Monday. The 39-year-old Day, viewed as a rising star in the coaching profession, was named Ohio State’s acting coach after Meyer was suspended last Wednesday after an independent investigation said he should have reported allegations of domestic violence against receivers coach Zach Smith to the compliance office at OSU. Some people were surprised that Day got the interim coach’s position over defensive coordinator Greg Schiano, a former head coach in the NFL and at Rutgers, and co-offensive coordinator Kevin Wilson, whose last job before Ohio State was as head coach at Indiana. Count Day among those who were surprised when he got the call from athletic director Gene Smith that he would be taking over the team. “It has been a whirlwind But my goal in this thing was never to replace Coach. That’s not what I wanted to do. What I wanted to do is empower the coaches, empower the leaders and just keep this thing moving. And I think we have done that,” he said. Day said he will be calling offensive plays from the sideline, along with Wilson, on Saturday when Ohio State opens its season against Oregon State at Ohio Stadium. Being the head coach, offensive coordinator and quarterbacks coach has been hectic at times, he said. “If you saw me in one of the scrimmages, I don’t know if you would have thought I balanced it very well,” Day said. “I was trying to coach the quarterbacks, call the plays and organize the scrimmage, and I looked like my hair was on fire. So it was a challenge. And there’s been times where I’ve felt like I’ve been drinking through a firehose, to be honest. Asked if he ever saw the uncertainty over Meyer’s situation began to wear on the team, Day said, “Not until the press conference on Wednesday (when Meyer’s suspension was announced). It happened late at night and then we got them up at 7 a.m., to have a team meeting. They looked a little tired there, I think it wore on them a little bit. “I would say 98 percent of the time from when this started until right now it’s been great. Really, that’s a tribute to the culture here. Our culture is strong,” he said. Day, who played quarterback when Chip Kelly was the offensive coordinator at New Hampshire and was an assistant coach with him with the Philadelphia Eagles and San Francisco 49ers, said he has received encouragement from his former head coach. “I think our coaching staff did, too. And most importantly, our players did,” he said. Meyer can return to coaching in practice on Sept. 2. —- OFFENSIVE LINE STARTERS: Three-year starter Michael Jordan will move to center from guard for Saturday’s game. Demetrius Knox will play right guard and Malcolm Pridgeon will play left guard. Isaiah Prince will start at right tackle and either Thayer Munford or Josh Alabi will be at left tackle. —- LINEBACKERS UPDATE: Baron Browning will start at middle linebacker against Oregon State with Malik Harrison and former walk-on filling the other two starting positions. Tuf Borland, who was a standout at middle linebacker last season before he suffered what is believed to be an Achilles tendon injury during spring practice, has healed so quickly that it is possible, though not likely, that he could play Saturday. Dante Booker, like Borland, is recovering from surgery. Other players, like Justin Hilliard and Keandre Jones, are also competing for playing time. “One of the things about our linebacker group is that we have great depth,” Schiano said. —- DEFENSIVE BACKS UPDATE: Ohio State will use a three-player cornerback rotation with Damon Arnette, Kendall Sheffield and Jeffrey Okudah. Isaiah Pryor will probably join Jordan Fuller as a starting safety. Interim coach prepares for opener against Oregon St.